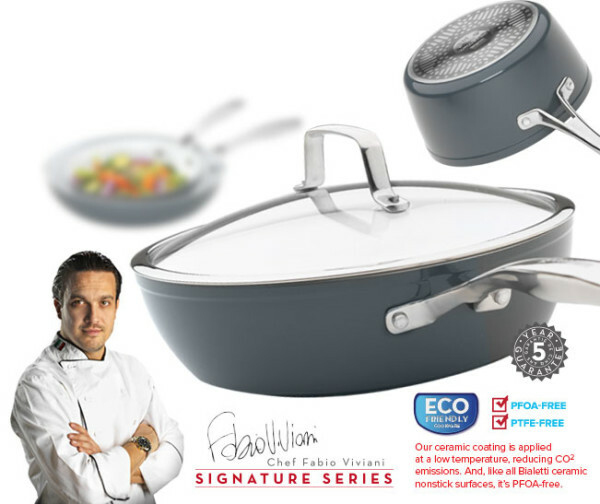 We are giving away a Bialetti Signature Series Ceramic 11″ Covered Deep Saute Pan by top chef Fabio Viviani. Bialetti began in Italy but has since become a leader around the world because of their high-quality products. Their products bring simplicity, functionality and beauty to the kitchen of any home. They offer advanced technology and distinctive styling that together create cookware that is simple to use and simply beautiful. Bialetti has teamed up with Top Chef Fabio Viviani to create a signature series of cookware perfect for the home. This cookware is a one of a kind leading innovator in the cooking industry market. It brings the professional kitchen to your home. The aeternum signature series has many features that make it stand out. So now it’s your turn to cook like the Chef Fabio! 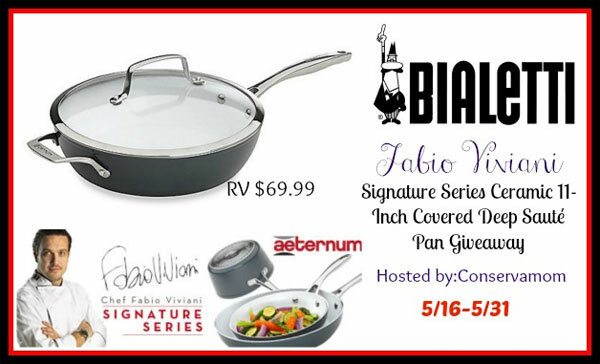 One winner will get their very own Bialetti® Aeternum “Fabio Viviani Signature Series” Ceramic 11-Inch Covered Deep Sauté Pan which retails for $69.99! Head over here to find out what Conseramom thought of this pan and what delicious Chef Fabio Viviani Recipe she cooked up in it! Giveaway is open to US only and ends on 5/31 at 11:59pm. Open to US only. Spaghetti or linguine with tomato or seafood sauce! Each noodle has its own sauce! I learned that in Italy fettuccine is served with a meat sauce. I learned that Fusill is served with meat sauce, more filling. I learned what Fusill is! And cant wait to try it! Fettucini goes with meat sauce, or your not in Italy. U.S. serves fettucini with alfredo & seafood, totally different approach. I learned that, in Italy, certain sauces go with certain shapes of pasta. Meat sauce should be served with Fettuccine, not spaghetti. I had no idea! I learned that in Italy sauces for noodles are different for each one. I learned that different sauces go with different types and shapes of pasta. I learned that if you do not get Meat Sauce with Fettucini Noodles – then your not in Italy – you must have been tricked by another country – funny – but true. I did not know that certain shapes of pasta go with certain sauces. I know that this may sound redundant, but I learned that if you have Fettuccine it is best to serve it with meat sauce and if it’s done any differently your not in Italy. I learned that different types of noodles go with different sauces. In Italy, fettuccine is served with meat sauce. I learned that each noodle goes with a different sauce!